God never coerces man's will, rather God gives the ability to believe through the work of the Holy Spirit. through the work of the Holy Spirit. is an active response to the character, words and actions of God, initiated by His revelation and enabled by His redemption, whereby the mind is transformed (e.g. belief, repentance), the heart is renewed (e.g. love, trust), and actions are surrendered (e.g. obedience, service), all in accordance with His will and in order to declare His infinite worthiness. Two things struck me about this definition….a)it doesn’t mention a location (church, synagogue, altar, Cleveland) and b)there is nothing passive about it. 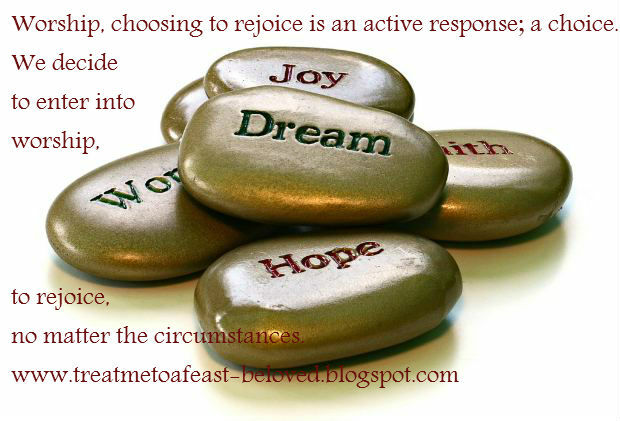 Worship, choosing to rejoice is an active response; a choice. We decide to enter into worship, to rejoice, no matter the circumstances. Did you know (I didn’t) that Psalms 34 is the precise definition of “Praise Him, Anyhow? Here’s the story…David had a price on his head when he departed Isreal. King Saul, pursuing him as he fled, intended to kill David. David ran straight to a Philistine city (you can imagine how that would work out), and schemed his way into the protection of the Gath King, Abimelech, not because Abimelech loved David, but because David pretended to be crazy. It’s bad luck to kill crazy people, so the King spared his life. (Compare that to your worst day…) David’s response? Praise. He chooses to rejoice, declaring that he will bless the Lord at ALL TIMES. What’s your excuse? Is someone trying to kill you? I didn’t think so. Even if that were the case, if you’re not dead yet, you can find a reason to praise the Lord. You can choose. David did, and he was busy outrunning the biblical equivalent of a mafia hit (sorry, I’m feeling happily irreverent today, and that’s a reason to praise Him, too). Choose to rejoice. Choose joy. Optimists live longer, survive bouts of illness and other tragedies more successfully and with less measurable stress that others, and can make anything better just by shifting not the circumstances, but their perspective. My BFF said something wise today (she does that at least once every day, btw), “gratitude is a practice. Like any muscle, it requires constant training.” I like that-rejoicing as exercise. I’m going to work out now, I’m off to rejoice and praise the Lord. Spiritual fitness-a brand new concept to me, and this day’s reminder that God is good.